Bob Dylan’s long and involved connection with the Grateful Dead continued in late 1999, when Dylan did a tour supported by Dead bassist Phil Lesh as the opening act in November and December. Lesh would frequently join Dylan onstage late in the show or during the encore, and they would frequently perform a Dead song as part of Dylan’s sets, like “West L.A. Fadeaway” or “Alabama Getaway”. The Dead song that Dylan most commonly covered was “Friend of the Devil”. Dylan began covering “Friend of the Devil”, as near as I can tell, in 1995 (he may have done it before that – I stopped looking), and he made it a regular part of his rotation in 1996 (when he played it live 21 times). It continued to be a part of the repertoire for several years after this. I first noticed it a couple of weeks ago, when it started to show up frequently on fan made anthologies of the highlights of his tours. I’m not sure that the song was always a highlight, but given the huge overlap between Dylan and Dead fandoms, it’s not surprising to find it popping up frequently. 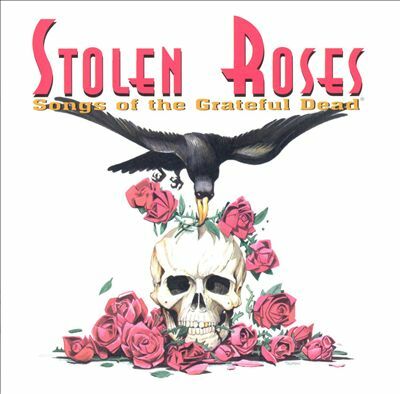 In 2000, Grateful Dead Records released a tribute album, Stolen Roses, and it included a live version of “Friend of the Devil” by Dylan. For the life of me I cannot figure out where and when it was recorded – even Bjorner doesn’t seem to have that information. I suppose you could listen to all of the hundreds of Dylan versions to try to figure it out, but I can’t say that it matters that much to me. Part of me wonders if they used a version with Lesh on bass, but the sites I looked at don’t even seem to know that. Could be, I guess. You can hear that version here. A number of sites do agree that the song is one of the weak points on Stolen Roses, largely because it is clearly taken from a bootleg recording, and not a very good quality one – the audience is really loud. So, it’s a nice gesture to include the song, but if he wasn’t going to record it in the studio I think I probably would have left it off. On the other hand, it may be a fitting tribute to the always semi-disfunctional relationship between Dylan and the Dead, one that only makes sense in theory and almost never in practice. I couldn’t find a good video of Dylan doing the song at the moment, so here’s Lyle Lovett and John Hiatt doing it. I saw Lovett perform last Monday, and he was great. His drummer was Russ Kunkel, and when he introduced him the immediate thought that went through my head was “he drummed on New Morning!”. Yes, I am that far gone. Bob Dylan returned to the Grammy Awards in early 2000, not as a nominee (no new music produced to speak of in the past couple of years), but as a presenter for Album of the Year. 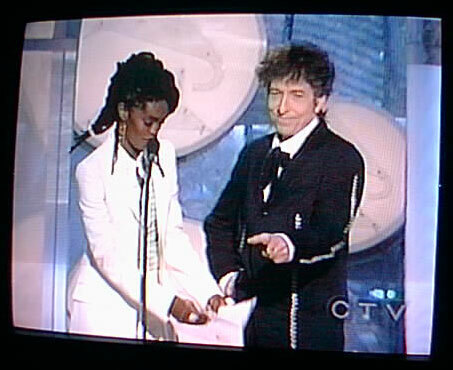 Dylan won that award in 1998, and he co-presented with Lauryn Hill (who won in 1999). Presumably the previous winner is brought back to give away the statue the next year, but perhaps Dylan was double-booked in 1999? I don’t know. I can’t find a complete clip of the presentation. You can see Hill reading the winner if you click through to the Grammys site here. Dylan is kind of funny here, pointing (I think) at Carlos Santana. Did he know who the winner was, or was he just suggesting that it should go to his friend? Likely the latter. It must have been a big moment for Santana, who won a slew of awards that night. Lauryn Hill was one of the guest stars on Supernatural, and he toured extensively with Dylan in 1993, so it was a pretty ideal set up in terms of the people up there to give him the big prize. Earlier in the show Santana performed “Smooth” with Rob Thomas. This song won three awards. Do you remember Matchbox 20? I had totally forgotten that they existed until I clicked on this video, and now it is stuck in my head. I’m terribly sorry. 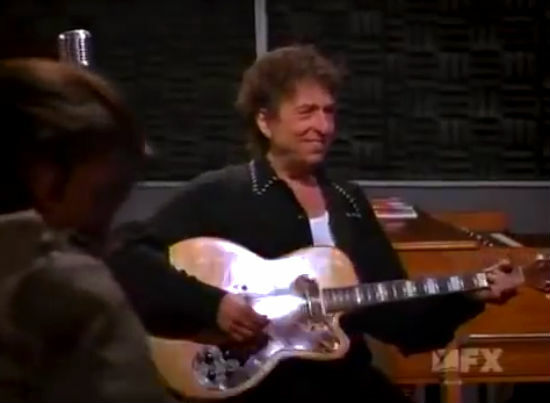 Sorry, not much to this one – just an early 2000 Dylan cameo. Bit of a bizarre jacket, if you ask me. (Hill, of course, looks great). Bob Dylan ended the 1900s on a bit of a downswing. In the midst of a four year drought where no new albums were released (and his only new song in 1999 was a redone version of “Chimes of Freedom” with Joan Osborne). There wasn’t much to report about all year. Notably, 1999 was the year that Bucky Baxter left the Never Ending Tour (in May), replaced by Charlie Sexton. Sexton had one hit in 1985 (“Beat’s So Lonely”) and has toured with Dylan from 1999 to 2002, from 2009 to 2012, and from 2013 to today. I already miss Bucky Baxter on the slide guitar, though there are some interesting new arrangements and solos that Sexton has brought to some familiar songs. Life moves on. The shows that I listened to all week were from all June and July (the tour with Paul Simon). It was an unusual tour, and clearly a nostalgia tour for the most part. The AP story about the announcement called it “nirvana for 1960s folk fans” and noted that each man would play a 75 minute set each night, flip-flopping the opening/closing spot. This was the first tour for Simon since 1992, with the AP noting that Simon had spent the last few years working on “the Broadway flop The Capeman”, which is something that I have never heard about in my life. Let’s start with Simon. I used to have no strong feelings about Paul Simon. Like every other white person on the planet, I owned a copy of Simon and Garfunkel’s Greatest Hits and I think that The Graduate has a great soundtrack. I kind of liked Garfunkel better than Simon, but if I’m being honest that’s just because Carnal Knowledge is such a great film. I hated the Paul Simon of the Graceland period, when it was inescapable on the radio, and his decision to break the cultural boycott of South Africa was simply unconscionable. Simon has “no regrets” and my feelings haven’t changed either – I think he’s a scumbag. So. Here he is touring with Bob Dylan, playing to the nostalgia crowd (the bank managers super-show, as my wife just put it). Someone has nicely put together a lovely little two CD bootleg called Boys in the Bubble that includes selections from various shows with each performing solo, and a few of them playing together. It’s a well done set (they’ve even included Dylan and The Grateful Dead doing (badly) “The Boy in the Bubble” from 1987 (they can’t remember all the words), and a 1992 Dylan cover of “Homeward Bound”). Each disc opens with one man introducing the other for his set, which is a nice little touch. Generally speaking, Dylan performed far more interesting sets than Simon did. Simon does his hits. Dylan did “Highlands” (the whole song!) and “Down Along the Cove”. There is no question that Dylan is the more interesting artist at this juncture by a wide margin. Evidence of this can be found on best four shows from the tour where Simon doesn’t appear. These are collected in a five CD bootleg titled Ace of Clubs, because Dylan was playing small venues (Tramps in New York City the night before a Madison Square Garden show with Simon; Bogart’s in Cincinnati and so on). These shows are fantastic (except for the occasional idiot fan whooping and hollering, but what can you do? ), and consistently a lot stronger than the big stadium shows. Dylan’s band is much more interesting when they’re trying to fill a small room than when they’re in full rockstar mode of any venue with a name like Coca Cola Star Lake Ampitheatre, Pepsi Arena, or Nissan Pavillion. I’d really recommend the Ace of Clubs collection as the highlight of the year, and I’d suggest simply skipping the Paul Simon shows. In the 1960s I’d have put Simon a step below Dylan, but at least in the same ballpark. In 1999? It’s not even close – Simon is the anchor dragging down the summer Dylan shows. With no new album and only a few guest spots in 1998, I spent a lot of time listening to Dylan bootlegs this week. 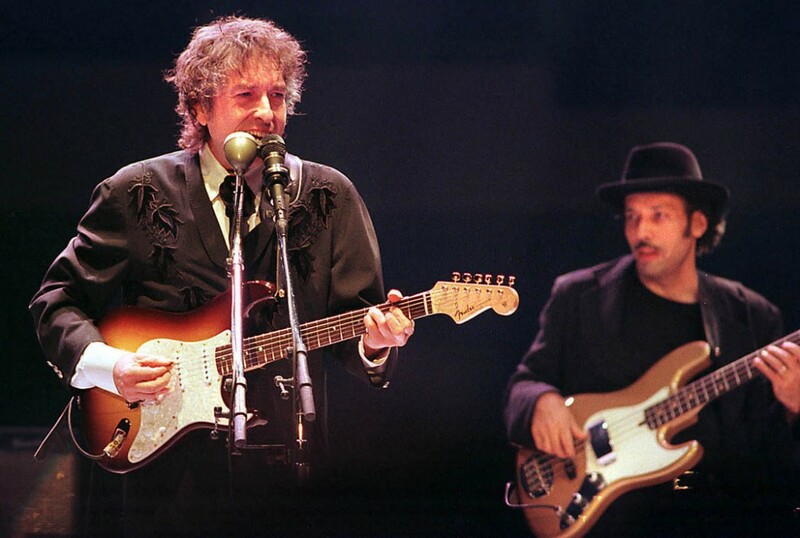 In 1998 Dylan kept on touring – performing the 1,000th show of the Never Ending Tour in Montreux at the Jazz Festival. I didn’t listen to that specific show as it didn’t earn any special praise anywhere that I saw. What I did listen to was a couple of compilations that I found really useful. One of the, Les Bons Moments, collects highlights from Dylan’s European tour. This is one of my favourite bootleg titles (for 1999 I have one titled Boots of Spanish Leather, which is highlights from his Spanish tour, that is even better). Another is a collection of better performances from Dylan’s New York City shows in 1998. Both of these are single CDs, and neither of them is totally awesome – there are some moments that left me thinking “if this is bon, what was mauvais?” At the same time, there is a great deal that I still like on these 1998 performances. One thing that struck me about the New York disc is how poor the crowd behaves at Dylan shows by this point in time. Just awful. When Dylan does an interesting, but little known song, like “John Brown” or “Tomorrow is a Long Time” they essentially chat through it. When he plays a hit like “Desolation Row” they cheer when they hear the first line, and then go back to chit chatting. Plus there is always at least one guy “whoooing” away like Ric Flair. I am really starting to become intolerant of late era Dylan crowds. One of the striking things about Dylan playing his hits thirty years later is that it always takes the crowd a few moments to pick up on the fact that he’s playing a song that they actually know. The version of “It’s All Over Now, Baby Blue” on the New York set, for example, begins with some frantic mandolin playing that segues into a Mexican guitar sound. It is impossible to imagine what song is coming until the lyrics finally arrive. This version is just completely different than any version that I had ever heard. Dylan and his band make even the most familiar of songs totally unpredictable, which is what makes these bootlegs worth listening to. Even when his voice fails him (increasing at this point) the musical creativity is still there. “It used to be like that, and now it goes like this”. One of the best ever Dylan lines from the stage, spoken during the “Royal Albert Hall” show in 1966 as a way of introducing “I Don’t Believe You”. The crowd in Manchester that night was having none of those changes – they boo, they stomp, they clap off rhythm trying to throw off Dylan and the Hawks. The English fans were furious at the rhythmic changes that Dylan introduced to his music, something that will be his hallmark for the rest of his career. 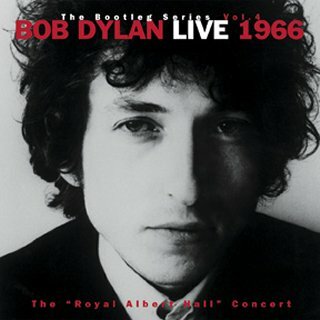 The only “new” Dylan material in 1998 was the Bootleg Series 4: Live 1966, The Royal Albert Hall Concert. I didn’t buy this when it came out, because I had the concert on vinyl as part of Zimmerman: Ten of Swords, but I remember that I was thrilled that it had an official release because it seemed to signal that the Bootleg Series was going to be a potentially ongoing and huge series (which it is – the eleventh volume is due later this year) rather than just the one off triple CD. I wrote about this show in the 1966 week, but listened to the show again this week. It’s fascinating to return to the scene of the crime this many weeks later. In January I thought that this was one of the best shows Dylan would ever do. I still think it’s great, but it has also fallen a great deal for me. There are so many shows now that seem much more interesting and alive to me now. I’m not knocking this – and the sound quality here is really top notch – just realizing how much I over-estimated it in retrospect. As I say, still a great show. The only song that I don’t much care for today is “Mr. Tambourine Man”, where Dylan sort of spits the word “to” into the microphone, popping it. This is far from my favourite Dylan song, and this version sort of irks me, but not nearly as much as the whole show irked his audience. In 1998, Bootleg Series v4 may have served for a lot of people as a reminder of the young, dynamic, vibrant, outrage-inducing Dylan that they once knew and loved (or knew and hated). For a lot of those people – including me – the contemporary Dylan would’ve seemed second or third rate. Today I’m finding more and more that I’m excited about the Dylan that is still to come, rather than nostalgic at looking back to the Dylan from early in his career. Can I give two strong examples of that? On a Dylan tour anthology that I have for 1999 he does “Highlands”. I can’t wait to wake up in the morning to listen to both of those tracks. Does he change the lyrics for “Highlands”? If he doesn’t, can he remember them all? It’s sixteen minutes long! More fascinatingly, in 2000 he’s going to start performing his worst song, “If Dogs Run Free”, for the first time (first ever: October 1, 2000 in Münster). I am so excited to see if he can turn this New Morning monstrosity into something worth hearing. With Dylan you have to keep moving forward into the past. So while it was nice to revisit 1966 briefly, there’s still a lot of future left to explore. 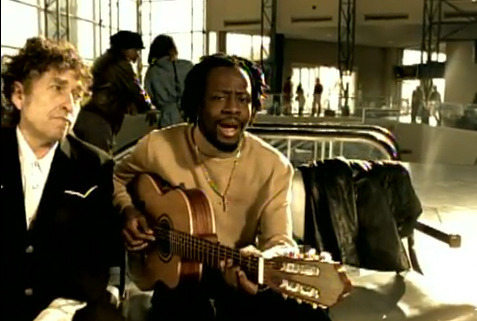 So sings Wyclef Jean in “Gone Til November” the third single from his first post-Fugees album, The Carnival. That would be a minor thing – lots of musicians have name-dropped Dylan – but the truly bizarre thing is that Jean then got Dylan to appear in the music video. Shot at an airport, Jean sort of wanders around singing this sad song about leaving his girl, and then, suddenly, he’s sitting on a bench and Bob Dylan is beside him in a black cowboy shirt just sort of, I don’t know, smiling beatifically at him. It’s kind of creepy. I don’t know about any of that. I mean, I certainly don’t get the idea that this song is about speaking out for the rights of anyone, but who am I to judge?